The following table lists weight of several persons in kilogram. I would like to convert them into pounds. The 'Insert Function' window opens > from under Select a function > select CONVERT > click OK or double-click on it. The 'Function Arguments' window opens. Here under Number > select or type cell B2 or type any number manually. Now the result is displayed in cell C2. Copy the formula down the column. By the way, I have formatted the Column C to get decimlas upto 2 places. Alternatively, you could type in cell C2 the CONVERT function exactly the way you see it in the above images [=CONVERT(B2;"kg";"lbm")] or [=CONVERT(96;"kg";"lbm")], then copying it for the rest of the cells. 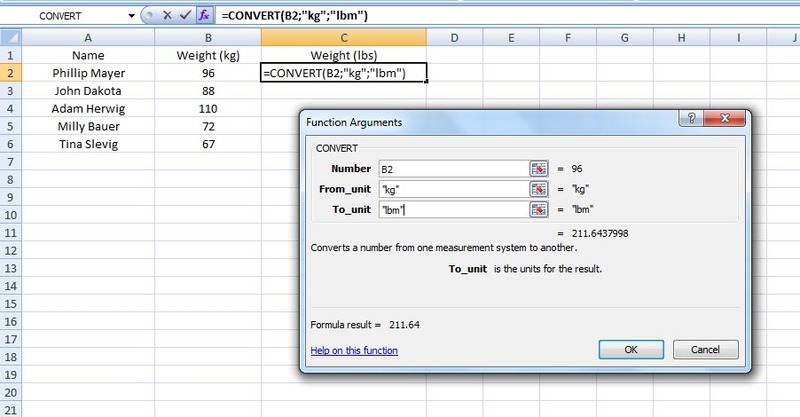 Day - "day" or "d"
Minute - "mn" or "min"
Second - "sec" or "s"
We all know that MS excel is one of best feature of Microsoft office which is responsible for data storage and conversion of any data to the essay writer.Some of the formulas are available in Excel for data handling.